As the 18th century became the 19th, the land that would become Madison Avenue between 36th and 37th Streets was part of the Robert Murray country estate. A well-to-do- merchant, he had signed a 42-year lease on 23 acres of “common land” in 1764, paying the city $250 a year rent. Later Murray purchased the land, which became popularly known as Murray Hill. 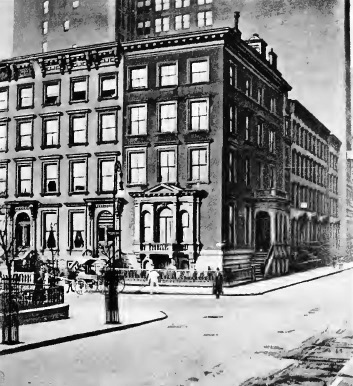 Shortly after the related Phelps and Dodge families built their imposing brownstone mansions on Madison Avenue a block to the south in 1854, John H. Sherwood began construction of handsome rowhouses on the opposite site—at Nos. 220 through 230. The last of these would be completed in 1859. As the century drew to a close, the block was still exclusive. At the southwest corner of 38th Street was No. 230 Madison Avenue, the mansion of millionaire Anson Stokes and his wife the former Helen Louisa Phelps. It was a gift of Helen’s father, Isaac Newton Phelps. The 220 Madison Avenue Corp. had hired architect Kenneth B. Norton to design its upscale building. Norton was no stranger to apartment building design; and in 1927 had published The Architecture of Co-Operative Apartments. Along with the six mansions on Madison Avenue, Nos. 16 and 18 East 37th Street would be demolished for the substantial building. No. 220 Madison Avenue would have all the amenities expected by upper class apartment dwellers. “Auto storage” for tenants only was provided below ground level and a private restaurant or “dining room” was planned for the ground level. brick; the first four floors were a modern take on the 18th century style of Robert Adam. Flat-faced stone pilasters rose three stories. Their modified neo-Classical capitals were surmounted by bas-relief urns—another Adam-inspired motif. The openings above the third floor cornice were ornamented by handsome paneled lintels. Residents would enter through a delicately-adorned 18th century-style doorway into a marble-wainscoted foyer with double doors below an arched and leaded fanlight. Norton's 1940s take on 18th century elements included neo-classical capitals, urns and paneled lintels. As the building neared completion in July 1941, artist Victor Seydel was hard at work on the lobby murals that honored the Murrays. The first to be completed depicted the Murray family’s coach “which was often seen on the famous Middle Road which cut through the Murray estate,” said The New York Times on July 13. The other murals would illustrate Kip’s Bay and the East River “where the British landed prior to going to Mary Murray’s house during the Revolutionary War;” the family home of Catherine Bowne, John Murray’s wife, in Flushing; and various other scenes of New York around 1800. But perhaps the ultimate nod to the history of the property was the building’s name: The John Murray House. 18th century-inspired motifs abound in the entrance and foyer. By now the first apartment lease had been signed in the $1,050,000 building. Edward L. Beck, manager of the New York Clearing House was first in line on February 26, 1941. By the time Seydel had finished the first mural in July, 20 more leases were signed. The first residents moved in just before the attack on Pearl Harbor. The United States entry into the war would have a noticeable effect on the lives of the tenants of No. 220 Madison Avenue. Socialite Mrs. Austin Baldwin became highly involved with the Red Cross; and Anne Baumann Spear, wife of Maurice R. Spear (executive vice president of the Helmsley-Spear real estate company), took to driving an army ambulance. By the war’s end she would be recognized by the Government for driving a total of 3,600 hours on Long Island. Gerald Bradford, Jr. left Madison Avenue to fight overseas. He was a Lieutenant commanding a “Catalina flying boat”—a navy bomber. The 23-year old lieutenant’s father, incidentally, had served in World War I and was now back in uniform as a naval commander. The widowed Mrs. Raymond Lewis Carpenter lived in the building at the time with her daughter, Helen Lois Carpenter. Helen’s uncle was Colonel William H. Beers of the U.S. Army. A graduate of upscale private schools, she was married in St. Bartholomew’s Church on June 12, 1943 to the dashing Army Lieutenant. Francis Harold Cloudman, Jr. The 23-year old groom had recently graduated from the United States Military Academy. His father was Major Francis H. Cloudman. It was a military wedding with the male members of the party in dress uniform. When Francis left to serve in the war, Helen Lois moved back into No. 220 Madison Avenue with her mother. Now pregnant, she would never see her husband again. On November 9, 1945 newspapers announced the Francis, now a captain, had been killed in Czechoslovakia. Doris Kavanaugh lived here with her parents at the time. Like Helen Lois Carpenter, she was educated in prominent schools—Trinity College in Washington DC and the Academy of Mount St. Vincent. She was employed by a Government Information agency before accepting a position with the Overseas Branch of the Office of War Information in 1943. She was sent to New Zealand in November to open the first OWI library there. By the time World War II ended, the main floor dining room had been converted to a restaurant, The White Turkey. Its chef in 1946, G. R. E. Ovide, was a somewhat surprising choice. Ovide grew up in Bordeaux and Marseilles and was trained in French cuisine. He had worked for three years on French ocean liners; but with the outbreak of war served in England and France baking bread for GIs. During his 15 months of service he estimated he had baked 15 million pounds of bread. Among the wealthy residents of No. 220 around this time was the family of greeting card manufacturer Stephen Usichon. The Usichons maintained a 20-room country home in Dutchess County and it was here in 1949 that they experienced remarkable terror. Betty Usichon intended for somebody to get hurt; but the guest had upset her plans. She was disarmed by one of the thieves. Before they left with $4,000 in cash and jewelry, the gunmen cut the phone wires and bound their victims, leaving them in the cellar. They also removed all the keys from the ignitions of the cars parked outside. Within the year armed robbery would strike much closer to home. Two men entered The White Turkey on February 25, 1950 and, after patiently waiting at the bar an hour for a table, sat down to eat at around 9:00. One of the men had come in without a tie, so hostess Julia Keegan loaned him one from the restaurant’s stock kept for such occasions. When the patrons were finished, they paid the bill of $7.50 and tipped their waitress $2.50. Then on their way out they pulled out guns and took $2,000 in cash from the cashier. But before escaping, the thief that borrowed the tie remembered to return it to Julia Keegan. Living in the John Murray House at the time were Harold S. Pollard, former chief editorial writer for the New York World-Telegram and Sun; and his wife, the once-famous stage actress Chrystal Herne. 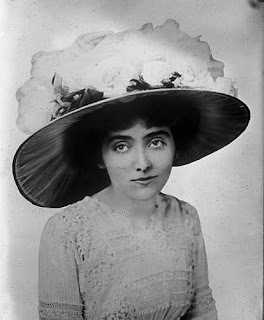 The daughter of James A. Herne, who had been one of the leading actors, playwrights and directors of his day; she had made her stage debut in 1899 at the age of 16. An immediate success, she was a leading lady until her last appearance at the 46th Street Theatre in January 1936 in A Room in Red and White. By 1957 Irving Hutter, president of a grocery store chain in the South, and his wife Phyllis lived in a 14th floor duplex apartments here. In April that year Phyllis left to visit friends for a few days. Irving stayed in the apartment in her absence. When she returned she discovered that furs were missing from a bedroom closet. Further investigation revealed that the safe in that closet had been rifled and $7,000 in cash was missing. Phyllis’s missing furs were valued at $15,000. The case was confusing to investigators as there were no signs of forced entry and the Hutter’s chauffeur was normally at home during the day. The Hutters’ bad luck continued three years later when Phyllis was awakened by the doorbell at 9:45 am on March 30, 1960. Through the door’s peephole she could see an employee of the building. What she could not see were the two gunmen on either side of the door who had forced him to ring the bell. Among the building’s more recognized residents around this time was billiards and swimming champion Edward Lee. Between 1931 and 1964 Lee had won 20 annual national championships in billiards. Another tenant was the highly-esteemed architect Walter Hesse. Well-known for designing restaurants, synagogues, schools and other buildings, he had produced more than 30 restaurants for the Schrafft’s chain; the famous Lindy’s, Leone’s, and “21” Club restaurants, and the Jewish Chapel at Kennedy International Airport. For many years he was the consulting architect for the New York Public Library and architect for the American Broadcasting Company. Three-quarters of a century after its completion, The John Murray House is little changed. Its prim neo-Classic inspired presence recalls a time when elegant brownstone mansions gave way to another type of upscale housing on Madison Avenue.